April 20, 2018 -- Contractions of the uterus play an important role in successful conception, but the lack of tools for quantitative analysis limits our understanding of those contractions outside pregnancy. In recent years, several ultrasound methods based on speckle tracking have gained attention for assessment of uterine contractions, but the tracking methods are still in the developmental phase and need optimization. In order to objectively evaluate the proposed tracking methods, researchers at the Eindhoven University of Technology have developed an experimental setup based on a human ex vivo uterus (Biomedical Physics and Engineering Express, 13 March 2018, Vol. 4:3, pp. 035012). Speckle tracking is an ultrasound-based imaging technique that analyzes the motion of a contractile tissue, such as the heart, for example, by tracking the speckle pattern produced by the ultrasound waves reflected by the tissue. This noninvasive method provides information about tissue motion. "Speckles," or "fingerprints," of the tissue are traced to identify patterns in the tissue motion; this can help analyze the tissue and diagnose any possible deformation. Ex vivo uterus used in the study and the experimental setup. Motion of the ex vivo uterus is created by an electromagnetic motor generating rotary motion at its output shaft. The voltage driving the motor is produced by a circuit board connected to a laptop and controlled by dedicated software. A screw-slider system connected to the output shaft of the motor converts the rotary motion into linear motion. A syringe connected to the slider system is used to inject and withdraw fluid into a balloon catheter. The catheter was inserted into the uterine cavity in saline to avoid air bubbles. Rhythmic uterine motion was induced by sinusoidal inflation and deflation of the uterine cavity. The researchers used a period of 20 sec (the average physiological contraction time) to simulate one cycle of rhythmic uterine motion. The motion generated by the experimental setup was validated with needles inserted in the myometrial wall of the uterus. Lin Xu, a researcher in the team, developed the hardware and accompanying software for the setup. A total of six needle markers were inserted in three ex vivo uteri. To check the reproducibility of the produced uterine motion, the researchers tracked the motion of the needles over time and compared it with the driving signal of the electromagnetic motor. They evaluated the agreement between the signals using metrics such as the correlation coefficient and mean square error. Further, to evaluate the speckle tracking performance of block-matching, they tested the setup with different block sizes. Comparing with the reference motion of the needle markers, one particular block size showed the highest agreement. 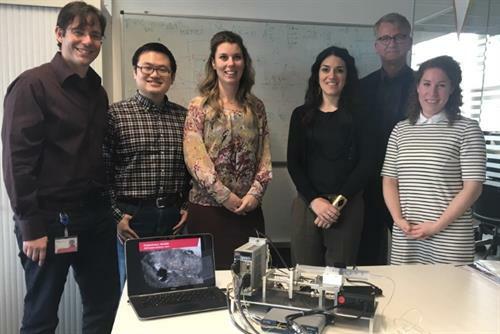 The researchers (left to right): Massimo Mischi, Yizhou Huang, Celine Blank, Federica Sammali, Benedictus Christiaan Schoot, and Nienke Petronella Maria Kuijsters. The researchers said this experimental setup can help in the development of uterine motion imaging methods by providing objective evaluation of their tracking performance. In addition, unhealthy uteri -- with pathologies such as adenomyosis or myomas -- may show different tissue motion with respect to healthy uterine tissue, and this experimental setup can be extended to reproduce different pathological conditions. The resulting, optimized, speckle-tracking technique will enable doctors and physicians to enrich their diagnostic information and improve treatment. Anmol Gautam is a doctoral student contributor to medicalphysicsweb and a final-year doctoral candidate at the University of Birmingham. His doctoral project was to determine the 3D structure of a bacterial protein KorB and its molecular interactions with DNA and other partner proteins, including the role of the disordered regions. © IOP Publishing Limited. Republished with permission from medicalphysicsweb, a community website covering fundamental research and emerging technologies in medical imaging and radiation therapy.